Set in the countryside near to Bieuzy Lanvaux and Pluvigner,on the edge of the Lanvaux forest, is the lovely group of buildings comprising of a house and longère with 3 rental units, a barn and over an acre of land. The owner's accommodation is a separate unit with lounge/diner, fitted kitchen, study, two bedrooms, shower room and toilet. The longère comprises three individual units, all with open plan diner/lounge and fitted kitchen, and then one with 1 bedroom, 1 with 2 bedrooms and 1 with 3 bedrooms. Separate small barn in stone and nearly 1 and ¼ acres of land. 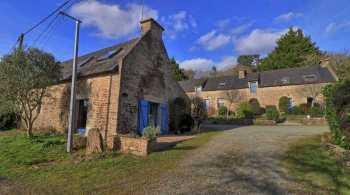 Ideal gite complex with scope for development, set on the edge of the Forest and with in 20 minutes of the coast.